Walking in the region of Aveyron I have been passing through some ridiculously pretty little villages. OTT every single one of them. 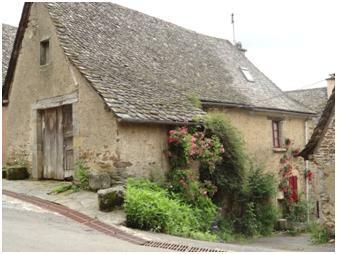 There are many of either derelict buildings all begging for some English DIY’ers to do a Grand Designs restoration on them, or lots of shuttered up houses waiting for their French owners to arrive for a 2 week summer holiday. In Saint-Come d’Olt the doors have cobwebs so thick on the outside, exposed to the weather, it must have been 10 years plus since they were opened. I have always said I would never buy a second home overseas that meant I would be tied to one place to keep returning to rather than keep exploring, but the temptation is very strong. If you think Grand Design type properties are only found by the very lucky, think again, turn 360 degrees anywhere in rural France and you will spot a dozen of them. Following ridiculously pretty village after pretty village, you would think nothing much more could impress you. 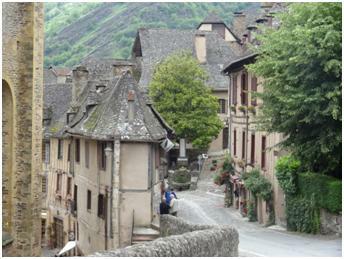 Then you get to Conques. Even the French are overwhelmed by Conques. It is perfectly preserved a ‘Grand Site de France’ – it feels like you are walking into the medieval ages mixed in with a dose of Hogwarts. I also get an explanation on why two elderly, but slightly suspicious men, stopped their car to ask where I was sleeping that night; it turns out they were just being helpful as they were on their way to the abbey to volunteer for the evening. The Accueil Abbaye Sainte-Foy is run by volunteers with 96 beds and is fantastically welcoming. Dinner is four courses with wine. If you are religiously inclined vespers are at 18:30, the pilgrims blessings after dinner is at 20:30, followed by an explanation of the Tympanoms (carvings above the abbey doors) wrapping up the evening with organ music and an illumination of the stained glass windows. Conques marks 200km completed of the 1600km.